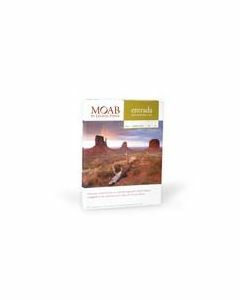 Moab by Legion Paper 8.5x11 190gsm, 100% cotton, double-sided, acid-free, buffered, natural white, no OBA, semi-smooth matte. To avoid printer damage, check your printer user manual to ensure it can print paper of this weight. Moab by Legion Paper 13x19 190gsm, 100% cotton, double-sided, acid-free, buffered, natural white, no OBA, semi-smooth matte. To avoid printer damage, check your printer user manual to ensure it can print paper of this weight.